Use the following calculator to estimate pace for a variety of activities including running, walking, and biking. The calculator can also be used to estimate time taken or distance traveled with given pace and time or distance. Note that placeholder zeros do not need to be entered in the "Time" or "Pace" field. For example, the time 5 minutes 3 seconds does not need to be entered as 00:05:03, and can be entered as 5:3. The following calculator can determine the pace of segments of a run (or other activity) for those with access to the time at intermittent points during the run. For example, if a person runs from point A to point B, then to point C, records the time at each point, and subsequently determines the distance between those points (using many available websites, applications, or maps), the multipoint calculator can determine how fast the person traveled between each pair of points, allowing use for training purposes; a person can run the same route (or distance) repeatedly and track pace over that given route, enabling comparison of times between each segment (or lap) to identify areas for potential improvement. The following calculator can be used to estimate a person's finish time based on the time and distance covered in a race at the point the calculator is used. Pace is a rate of activity or movement, while heart rate is measured as the number of times that a person's heart contracts over a minute. Pace and heart rate have a positive correlation; higher pace corresponds to higher heart rate. The use of both in training can help a person improve performance, avoid over-training, as well as track progress and fitness over time. Heart rate can be measured in different ways, from using devices such as heart rate monitors, to simply looking at a watch while measuring pulse at some peripheral point such as the wrist or neck. Some of the more notable measurements of heart rate include resting heart rate and maximum heart rate which are often used to estimate specific target heart rate zones to determine different levels of exercise. Typical adult resting heart rates (RHR) are commonly cited to range from 60-100 beats per minute (bpm), though there is some argument that normal RHRs actually fall within the range of 50-90 bpm. Generally, a lower RHR indicates more efficient heart function, though RHRs that are lower than 50 bpm can be a sign of an underlying heart condition or disease. The same is true of RHRs above 90 bpm. Although it is the most commonly cited formula, and is often used to determine heart rate training zones, it does not have a reference to any standard deviation, and is not considered a good predictor of MHR by reputable health and fitness professionals. Furthermore, MHRs vary significantly between individuals, even those with highly similar training and age within the same sport. Nevertheless, MHR determined using the above formula is often used to prescribe exercise training heart rate ranges, and can be beneficial as a reference. 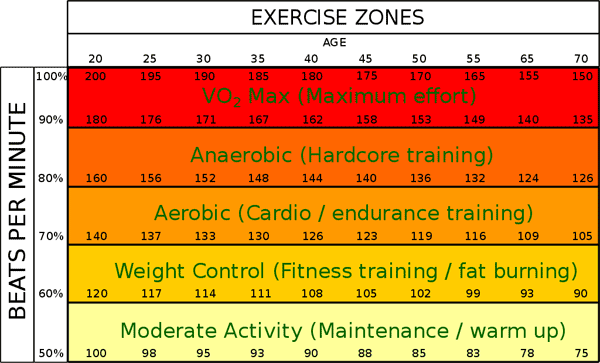 Note that an exercise intensity level of 60-70% of maximum heart rate is considered the ideal range for burning fat. Refer to the figure below for further detail. In solely aerobic exercise, there is sufficient oxygen for a person's muscles to produce all the necessary energy for the exercise. In contrast, in anaerobic exercise, the cardiovascular system cannot supply muscles with oxygen quickly enough, and muscles break down sugar to supply the necessary energy, resulting in an excess of lactate (a byproduct of glucose metabolism). Excess lactate causes the burning sensation in muscles typical of anaerobic exercises and eventually makes the continuation of exercise not possible if excess lactate is not allowed sufficient time to be removed from the bloodstream. Note that although lactate is also produced in aerobic conditions, it is used almost as quickly as it is formed at low levels of exercise, and only trace amounts leak into the bloodstream from the muscles. Understanding aerobic exercise is particularly important when training for a long-distance activity such as a marathon. Determining a pace that can be maintained while using energy primarily derived through aerobic means, referred to as an "aerobic threshold pace" helps maintain a balance between fat and carbohydrate utilization. This pace requires a relatively low level of intensity, and is usually maintainable for a few hours. Increasing aerobic threshold pace allows for a faster sustainable pace and is a large aspect of many marathon training programs. Wikipedia: The Free Encyclopedia. "Heart rate." en.wikipedia.org/wiki/Heart_rate. Darley, Jesse. "The Power of Pace & Heart Rate Training." www.active.com/running/articles/the-power-of-pace-and-heart-rate-training. Friel, Joe. 2014. "Common But Confusing Training Terms." www.joefrielsblog.com/2014/06/common-but-confusing-training-terms.html. Gaudette, Jeff. "How to Find the Right Race Pace and Why the Wrong Pace Sets You up for Failure." www.active.com/running/articles/how-to-find-the-right-race-pace-and-why-the-wrong-pace-sets-you-up-for-failure. Lovett, Richard A. 2013. "Find Your Tempo." www.runnersworld.com/race-training/find-your-tempo.